Welcome back to The Dog Pawlour blog! Winter is on its way out here in Greeley and the first day of spring will be here before we know it. If you’re like many people, you will start spring cleaning your home over the next few weeks to get rid of the winter clutter in preparation for the warmer months ahead. 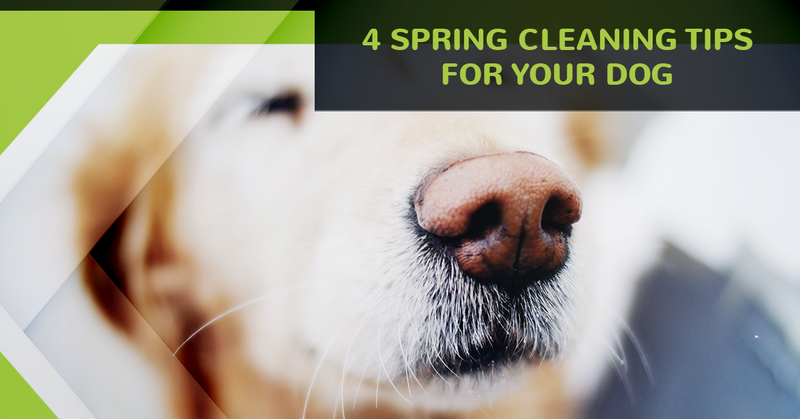 As you begin cleaning your home, you’ll also want to consider giving your furry friend a thorough “spring cleaning.” Below are some tips you can follow to clean your dog and get him or her looking and feeling great for spring. Please continue reading below. Spring is a great time to inspect your dog’s facial features. As with humans, the dry winter weather here in Northern Colorado can be harsh on dogs. Take some time to use a luke-warm washcloth to gently cleanse your dog’s face. Softly wipe around their eyes to remove any eye goobers or tear stains. Wipe around their nose and check for any dryness or skin irritations that need to be addressed. Gently lift their lips to check their gums and open their mouth to give their teeth a good once-over. If you have a doggie toothbrush and toothpaste, give their teeth a good brushing to remove any tartar buildup. Using a circular motion throughout their face and head, give them a nice, calming head and face massage to end their at-home facial. We get some serious wind here in Greeley. Dogs with large ears or ears that stand upright tend to capture a lot of dirt in their ears when playing outdoors in windy weather. Before thoroughly cleaning their ears, stop by The Dog Pawlour® Markteplace and pick up some all-natural ear cleaner to use at home. First, inspect their ears for debris, and then apply the ear cleaner solution to loosen any dirt. Use a cotton swab or soft cloth to gently wipe away any buildup. Your dog’s ear canals are complicated, so remember to NEVER stick anything in their ears such as Q-tips, tweezers, or any other objects that could injure their ear. Next, you’ll want to check your dog’s pads for any cracks, abrasions, and inspect their nails for issues that could limit their function. Walking on cold, rough surfaces such as ice, snow, surfaces with ice melt, and frozen ground during wintertime can create a lot of wear and tear on your dog’s feet. You’ll want to check for any injuries to their pad and nails so that you can take care of them before they become more active this spring. If you notice any issues that look serious or infected, call your vet right away. Our professional dog grooming team at The Dog Pawlour can take care of all of your pet grooming needs. Our dog grooming services include a thorough brushing and cleaning, toenail trimming, ear cleaning, paw pad inspection (and nail trimming, if needed), and more! We’ll finish their doggie spa experience with a bandana, breath freshener, and a spritz of specially formulated canine cologne. Call us today to schedule your puppy pal for a springtime dog grooming in Greeley!